For catering purposes, please ensure that you notify Nathan or Natasha Smith, at Duart Homestead of all apologies and guest attendances prior to 1 pm on the day of the meeting or event. Ring 03-5147-1985 or email - duart@maffra.net.au or by written entry in the Meeting Apology Book. 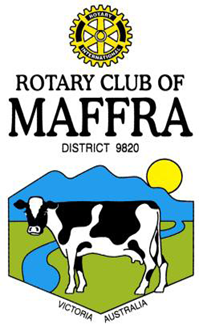 Maffra Rotary Club was Chartered on 29th May, 1947. The sponsoring Club was the Rotary Club of Sale, with Charter President Ken Davies, along with Secretary Norman Webster and Treasurer Frank O'Dea. Currently Graeme Hemming is the President who has served two previous terms as President, in 2011-2012 and 2017-2018. Maffra is situated approximately 20 minutes north/north west of Sale in the Macalister Irrigation District. Dairying, cropping, vegetable growing, retail and tourism are important businesses to our district. We are situated approximately 1 hour from the 90 mile beach, 1 & 1/2 hours from the snowfields and less than 30 minutes from the high country for 4 wheel driving. 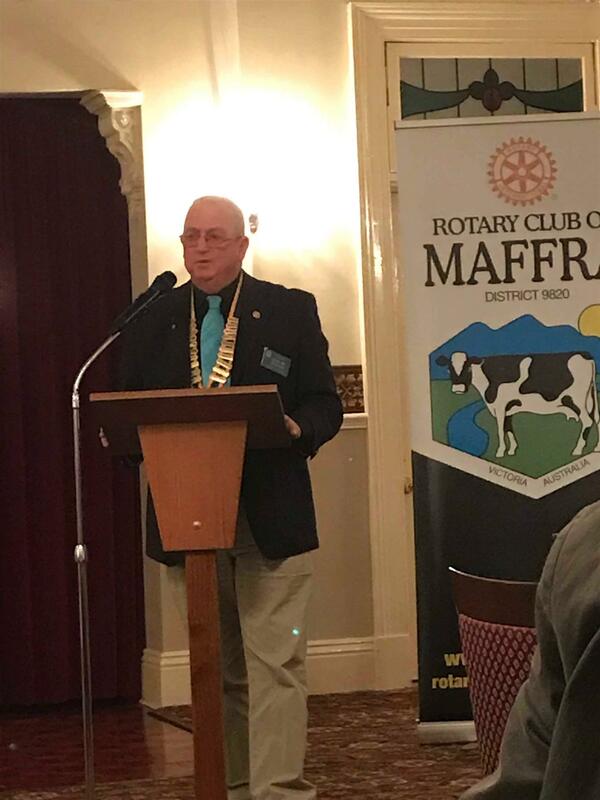 Maffra Rotary Club plays an important part in our community supporting various local organisations. We are the organising body for the annual Rotary Club of Maffra Mardi Gras, the oldest street event in Wellington Shire. The Club was recently asked to become the organising body for the local community market. The market has been revamped and rebadged as the Rotary Club of Maffra Community market which is held on the 1st Sunday of each month, except for January. We are involved in many Rotary youth programs such as Youth Exchange, Model United Nations Assembly, National Youth Science Forum and support other Rotary programs such as the eradication of polio, literacy, and our own Rotary Foundation. If you are visiting the area, come along to one of our dinner meetings which are held at Duart from 6pm on the 1st & 3rd Thursday of each month. Any 5th Thursdays are a social occasion held at an outside venue.